Heart surgery scars are a painful reminder of a long healing process following the trauma of open heart surgery. A sternotomy scar is often large and may remain tender long after the surgery. 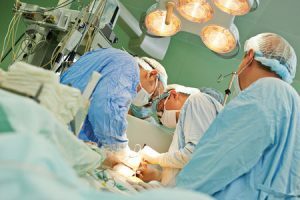 Surgery is, by nature, an invasive trauma to the body. Scars are the result of the body’s efforts to repair the damage. Why Don’t Scars Go Away? When the dermis, or skin, is damaged, the body does its best to repair the damage. Since the dermis is the first line of defense against invading germs and bacteria, it must be repaired as quickly and efficiently as possible. Therefore, rather than take the time to regrow normal skin, the body resorts to producing large amounts of collagen, a thick, fibrous tissue, producing a scar and protecting the body from invading bacteria. Do the Scars From Open Heart Surgery Go Away? While scars fade over time, a sternotomy scar will never fade entirely. The damage to the dermis and underlying tissue is far too extensive for the body to heal entirely. The scar may remain tender and “tight” for years following the surgery and will never go away. There are steps the patient can take to reduce scarring and help the body heal following surgery, but the open heart surgery scar will always remain. Can You Replace Scar Tissue with Normal Tissue? It is not possible to replace scar tissue. Producing scar tissue and healing the incisions from invasive surgery takes all of the body’s resources. Once the wound is sealed and the body protected from foreign bodies and bacteria, the scar is permanent. It will fade in time, but it will never disappear entirely. Can a Person Have Heart Surgery Without Opening Up the Chest? Minimally invasive, bloodless heart surgery involves using techniques that don’t require a large incision. With modern technology and techniques, it’s possible to repair damage to the heart and carry out many surgical procedures without subjecting the body to the trauma of a large incision.